What's the right hemisphere doing? This is a question that has been bothering me for about two years, emerging from the results of an fMRI experiment that I performed in the twilight of graduate school, and recently butting into my consciousness again after Greg and I finally published the paper. 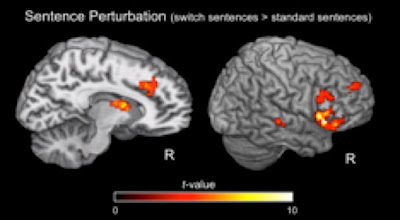 The paper is called “‘Syntactic perturbation’ activates the right IFG, but not Broca’s area or the ATL”, recently published in Frontiers in Psychology as part of a special topic on “Components of the Language-Ready Brain” edited by Cedric Boeckx and Antonio Benítez-Burraco. The title is a bit of a mouthful, I know. What we showed is that when you’re producing a sentence, if you’re forced to change the structure of the sentence-mid utterance, the right IFG (among other areas) lights up like a Christmas tree. I think it’s a good paper, but what’s important about it are not the specific results, but rather the larger question that the results point toward. Hemispheric asymmetries were all the rage in the 60s and 70s, but have died out in the last couple of decades. However, just as Mad Men brought back 60s fashion and interior decor, I’d like to bring back the hemisphere question. So let me ask again. What’s the right hemisphere doing? I think there are some reasons to suggest that this question is actually important (you know, for science) rather than for the purposes of explaining that line in the table of significant activations in your fMRI experiment. Let me lay out some of the reasons why there is a real question here. What I really want to do is find out if other people have also thought about this, and what the contents of those thoughts are. Does anyone ever look at images like this (taken from Tyler et al., 2011) and wonder what that right hemisphere activation reflects? Given the received wisdom of left hemisphere language dominance, these are pretty unexpected results. In fact, many of these studies have used manipulations that, when getting activation in left IFG, supposedly justify this region’s involvement in syntax – the core component of language that is putatively specific to it (Hauser et al., 2002; Bolhuis et al., 2014). Take syntactic violations. Here’s an exercise – find a study of syntactic violations that doesn’t activate right IFG. You won’t find any – they all show increased activation in the right IFG. If increased activation for syntactic violations justifies the left IFG’s role in core syntax, then you’d be justifying the right IFG’s role in core syntax. I don’t think either conclusion is warranted, but the results need to be explained. The right IFG often activates for ambiguity (Zempleni et al., 2007; Tyler et al., 2011), garden-path sentences (Chan et al., 2012), non-canonical structures (Fiebach et al., 2005; Bornkessel-Schlesewsky et al., 2010), and for switching sentence constructions (Matchin & Hickok, 2016). I don’t think these results can be explained away very easily. In children, if you have a stroke in the left hemisphere, you surprisingly turn out to be pretty much fine with respect to language. Why? Because everything that the left hemisphere would have done switches to the right (Tivarus et al., 2012; Basser et al., 1962). I think this points out pretty clearly that whatever the left hemisphere does in language, the right hemisphere can also do. This suggests that the left hemisphere acquires its affinity for language in some way that also allows language-dominance to emerge in the right hemisphere, such as similar connectivity. Doesn’t this suggest some interesting clues about how language grows in the brain? And doesn’t this also suggest some natural division in normal, right-handed adults, whereby the left and right hemisphere play some a symmetrical role with respect to sentence processing, operating over similar kinds of information but in different ways? All through grad school Greg beat me over the head (but in a loving way) with the fact that Broca’s area doesn’t do syntax – patients with agrammatism, and presumably damage to Broca’s area, can do complex acceptability judgments without much problem (Linebarger et al., 1983; Wulfeck & Bates, 1991). Acceptability judgments are what syntacticians have used for decades to develop syntactic theory. Making correct judgments can often be hard for the syntacticians – the fact that patients with severe language disorder can make them is telling us a lot. Interestingly, the right hemisphere of split-brain patients can also make acceptability judgments (Baynes & Gazzaniga, 1988). I think this means that the right hemisphere much have some kind of syntactic magic. There is less data for this one. There is some data, though – Caplan et al., 1996 show that damage to the right hemisphere can result in sentence comprehension problems, particularly for syntactically complex structures. Other lines of work suggest that patients with right hemisphere damage have problems suppressing context-inappropriate interpretations (Tompkins et al., 2001), particularly important for getting the punchlines of jokes or understanding metaphors. If you believe that there are useful analogies to be drawn between language and other domains, like vision or motor control, then we ought to pay attention to what these people are saying about the right hemisphere. Adam Aron has been claiming, with very good evidence, that the right IFG is the key region involved in “stopping” (Aron et al., 2014). That is, you’re about to reach for that cookie, you spot your mother out of the corner of your eye, and you as sure as hell do not reach for the cookie. That’s stopping – the inhibition of a planned motor behavior. In our Frontiers perturbation paper we pointed out the similarity of our activations to the stopping literature. Without the fear of the lash of reviewer B, I can speculate more freely here. My hypothesis is that in sentence processing you generate predictive templates for syntax and semantics in the same way that you generate motor plans. This has close similarities to work by Tom Bever and colleagues (Fodor et al., 1974). I think that generating these templates relies on the left IFG. If you need to cancel or change those schemata, you employ a stopping mechanism. This relies on the right IFG. Hence damage to the right hemisphere results in deficits for particular syntactic constructions or for obtaining non-literal interpretations of sentences – if you can’t suppress your original prediction, you’ll miss the joke or be unable to revise the predicted structure. More broadly, both hemispheres have significant access to the basic syntactic mechanisms of language. In development, the left develops into a “go” function, and the right develops into a “stop” function. These complementary mechanisms are not set in stone, though – this allows for the right hemisphere to take on a “stop” function if the left is damaged, or for left-handers to have more even distribution of “stop” and “go” juice across the two hemispheres. This makes some predictions – patients with right hemisphere damage should have some serious problems with things like garden-path sentences. More generally, subtle clinical testing should reveal a wide array of syntactic and semantic problems when inhibition is required. What do you think? I am curious to hear what everyone has thought about the right hemisphere and its role in language broadly. Is it doing something interesting? Or should we just ignore these right hemisphere activations entirely? Aron, A. R., Robbins, T. W., & Poldrack, R. A. (2014). Inhibition and the right inferior frontal cortex: one decade on. Trends in cognitive sciences, 18(4), 177-185. Basser, L. S. (1962). Hemiplegia of early onset and the faculty of speech with special reference to the effects of hemispherectomy. Brain, 85(3), 427-460. Bates, E., Wulfeck, B., & MacWhinney, B. (1991). Cross-linguistic research in aphasia: An overview. Brain and language, 41(2), 123-148. Baynes, K., & Gazzaniga, M. S. (1988). Right hemisphere language: Insights into normal language mechanisms. Language, communication, and the brain, 117-126. Bolhuis, J. J., Tattersall, I., Chomsky, N., & Berwick, R. C. (2014). How could language have evolved?. PLoS Biol, 12(8), e1001934. 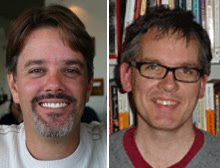 Bornkessel-Schlesewsky, I., Grewe, T., & Schlesewsky, M. (2012). Prominence vs. aboutness in sequencing: A functional distinction within the left inferior frontal gyrus. Brain and language, 120(2), 96-107. Caplan, D., Hildebrandt, N., & Makris, N. (1996). Location of lesions in stroke patients with 679 deficits in syntactic processing in sentence comprehension. Brain, 119(3), 933-950. Chan, Y. C., Chou, T. L., Chen, H. C., & Liang, K. C. (2012). Segregating the comprehension 681 and elaboration processing of verbal jokes: an fMRI study. NeuroImage, 61(4), 899-906. Fiebach, C. J., Schlesewsky, M., Lohmann, G., Von Cramon, D. Y., & Friederici, A. D. (2005). Revisiting the role of Broca's area in sentence processing: syntactic integration versus syntactic working memory. Human brain mapping, 24(2), 79-91. Fodor, J., Bever, T., & Garrett, M. (1974). The psychology of language: An introduction to psycholinguistics and generative grammar. New York: McGraw-Hill. Linebarger, M. C., Schwartz, M. F., & Saffran, E. M. (1983). Sensitivity to grammatical structure in so-called agrammatic aphasics. Cognition, 13(3), 361-392.
activates the right IFG, but not Broca’s area or the ATL. Frontiers in Psychology. 7:241. Tivarus, M. E., Starling, S. J., Newport, E. L., & Langfitt, J. T. (2012). Homotopic language reorganization in the right hemisphere after early left hemisphere injury. Brain and language, 123(1), 1-10. Tompkins, C. A., M. T. Lehman-Blake, A. Baumgaertner, and W. Fassbinder. 2001. Mechanisms of discourse comprehension impairment after right hemisphere brain damage: suppression in inferential ambiguity resolution. Journal of Speech, Language and Hearing Research 44(2), 400–15. Tyler, L. K., Marslen-Wilson, W. D., Randall, B., Wright, P., Devereux, B. J., Zhuang, J., ... & Stamatakis, E. A. (2011). Left inferior frontal cortex and syntax: function, structure and behaviour in patients with left hemisphere damage. Brain, 134(2), 415-431. Zempleni, M. Z., Renken, R., Hoeks, J. C., Hoogduin, J. M., & Stowe, L. A. (2007). Semantic ambiguity processing in sentence context: Evidence from event-related fMRI. Neuroimage, 34(3), 1270-1279. Hi William - interesting thoughts. I'm not on very firm ground here, but the right hemisphere also shows up reliably in word production tasks (e.g. Indefrey&Levelt, Cognition 2004), and more in picture naming than in word generation (I&L figure 4). If I remember correctly, structural and functional differences between stutterers and normal speakers have been found bilaterally. I would therefore like to propose adding "Self-monitoring" to your list of possible contributions of the right hemisphere. It's my impression that you see the RH less in single-word comprehension compared to sentence comprehension tasks, and the latter may involve more production and self-monitoring. However, there are a couple of fMRI studies by Bozic&Marslen-Wilson that argue RIFG is involved in semantic processing of morphologically complex words in isolation. With respect to your Frontiers paper, I'm not sure whether I am reviewer A or B, but the problems I had were 1) your results for structure and complexity were not very strong, and didn't replicate previous results, 2) you did not show "similarity of your activation to the stopping literature", you actually replicated the stopping literature. You did not show overlap between activation in a somewhat natural sentence production tasks with activation in a stop-signal tasks, your task explicitly required subject to interrupt ongoing processing. I'm therefore not convinced that your results tell us something about the role of the RH in sentence processing. Reviewer B is a hypothetical reviewer; I appreciated your detailed comments very much! And thanks for chiming in here, too. Our results did confirm that stopping applies not just to hand/finger actions but also to speech production. I agree though that our results alone do not point toward an understanding of the right hemisphere in sentence processing. Rather, the fact that we obtained robust right IFG activation pointed our noses toward the interesting overlap between right IFG activation for particular kinds of sentence comprehension experiments and the stopping experiments. Just as people have observed overlap between sentence comprehension and working memory or cognitive control tasks in left IFG, we're doing the same with the right IFG. I think that interruption of ongoing processing is precisely the role that the right IFG is playing in sentence processing. I wouldn't expect simple sentences to activate the right IFG, but it has been shown by others that garden-path, ambiguous, and non-canonical sentences activate the right IFG. The experiment hasn't been done to show precise overlap between stopping and these types of sentences, but I think the cross-experiment overlap is telling. I think the word production/picture naming data you point to is very interesting and quite relevant. I suppose the question is what the mechanisms involved in self-monitoring are - wouldn't "stopping" or inhibition be a core part of self-monitoring, or a downstream consequence of self-monitoring? I can imagine that a huge problem in stuttering is that there is an overactive inhibition mechanism that prevents fluid production. Just glancing over Indefrey & Levelt 2004, I notice that left IFG is active for both picture naming and word generation, but right IFG is only active for picture naming. I don't know the details of particular tasks used in each experiment, but I think there are interesting differences between these tasks that may isolate an inhibition mechanism. Picture naming requires precise selection of the target word - competitors have to be suppressed. Word generation is kind of free-form - all words that come to mind are valid. So if the left=go you'd expect it to be active for both tasks; if right=stop you'd expect it only to be active for picture naming.